Ever open up a file and it comes up in a different application then you wanted it to? Whether it’s an image that you want to view in Preview rather then Photoshop or a text file you want to open in Word rather then TextEdit. There is a fix for that. Warning: The steps above will only change the default behavior of that specific file. 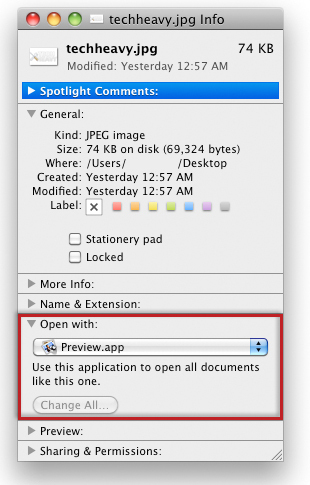 If you click the “Change All” button you will change that file types association across Mac OS X, causing all instances of that file to open in the application you chose. Example: If you want every single .jpg to open with Photoshop rather then Preview then click “Change All” otherwise only follow the above steps for changing that specific file.